We here at Travel Treasures and Tours understand things come up that are out of our traveler’s control. With that said, we also are trying to offer the lowest rates you can find and so we have to limit costs from travelers canceling. Below you will find our cancellation policy for all our trips. However, we want to stress that we do not charge for name changes even up to the day of the departure, as long as there are no fees from a 3rd party vendor. Typically, these vendors include cruises and flights. The vast majority that do not have flights or cruises allow us to offer name changes at no additional charge. We also want to stress that although our policy is laid out below we do try and work beyond our policy to take care of our customers. Please notify the office as soon as you know of something that may prevent you from going on a trip. Depending on how early it is from the departure date, we may be able to do more than what is listed in this policy. If you have any questions please don’t hesitate to call. There will be NO REFUND of the deposit given without Cancellation protection. Additional deposits may be asked for if required for pre-paid theater, airline, cruise, event tickets, meals, or hotels, etc. This amount is also NON-Refundable. Once purchased all tickets become the property of Travel Treasures & Tours and will be remitted in at the time of the event during the trip in accordance with company policies. The final payment is transferable if canceled 31 days prior. There are no refunds for any portion of this tour if canceled after 46 days prior to the departure date noted on this contract. If Cancellation Protection is purchased, you will have up to 31 days before the trip to cancel with a full refund of both the deposit and balance of monies paid, minus those paid for the cancellation protection. Any monies paid to vendors prior to cancellation that are non-refundable will not be paid back to the passenger. This especially includes (but is not limited to) airline, cruise tickets, show tickets, etc, unless Cancellation or Interruption Insurance is purchased from an outside vender company. This vender company has its own policies in which we will get a copy of their policies made available to you at time of purchase if purchased through TTT. 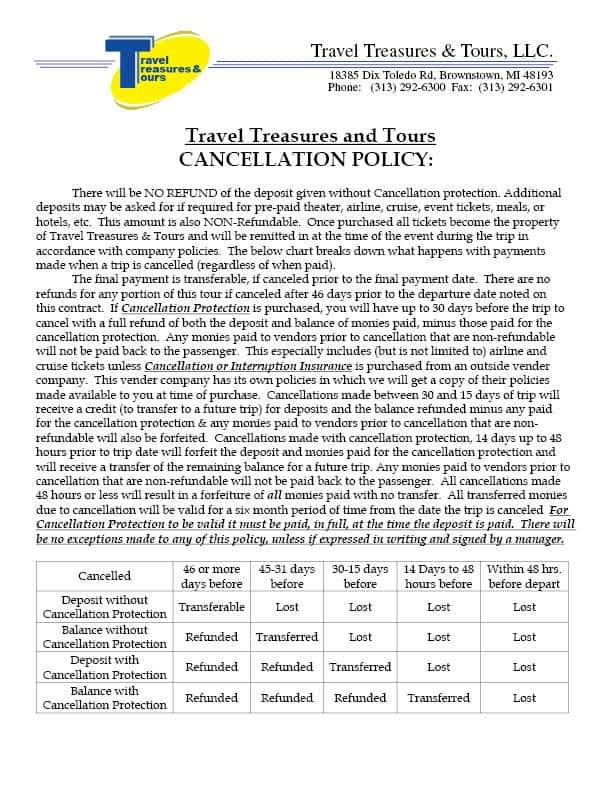 Cancellations made with Cancellation Protection, between 30 and 15 days of trip will receive a credit (to transfer to a future trip) for deposits and the balance refunded minus any paid for the cancellation protection, credit card fees, & any monies paid to vendors prior to cancellation that are nonrefundable will also be forfeited. Cancellations made with cancellation protection, 14 days up to 48 hours prior to trip date will forfeit the deposit and monies paid for the cancellation protection and will receive a transfer of the remaining balance for a future trip. Any monies paid to vendors prior to cancellation that are non-refundable will not be paid back to the passenger. All cancellations made 48 hours or less will result in a forfeiture of all monies paid with no transfer. All transferred monies due to cancellation will be valid for a six month period of time from the date the trip is canceled. For Cancellation Protection to be valid it must be paid, in full, at the time the deposit is paid. There will be no exceptions made to any of this policy, unless expressed in writing and signed by a manager. If at anytime Travel Treasures and Tours cancels a trip for low passenger count, a full refund will be given. This refund includes monies transferred, Credit Card fees and gift certificates. All payments made by cash, credit, debit, or check, will receive monies back in check form approximately 2-3 weeks (at most) after you are contacted. In that time any monies owed are available for transfer immediately. All payments made by gift certificate or transfer will be made available to transfer for a trip in the future. A transfer of this sort must be used within 6 months of the cancellation date, however, it can be for a trip that is further out. Discounts will be handled on a person by person basis and is up to the discretion of TTT and its staff. By signing up for a trip all passengers agree to all policies both listed here or elsewhere by TTT.